Please read the chapter Patch Editor in order to learn more about the Patch in general. This chapter focuses on working with DVI fixtures. Patch Editor and DVI Patch are about one and the same tool. The term DVI Patch specifically refers to working with DVI fixtures. 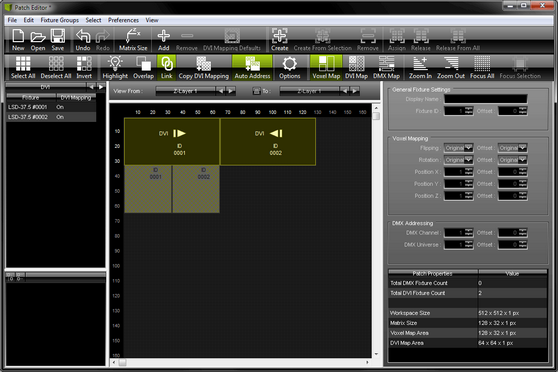 On the one hand, working with DMX-based fixtures is relatively easy and can be managed with the help of the Patch Editor without much difficulty. You can simply add fixtures, rotate them, or add space between fixtures, for example. Without the DVI Patch, on the other hand, it would not be possible to add rotation or spacing to DVI-based fixtures, because of how DVI hardware controllers work. to your LED installations with DVI fixtures. DVI controllers receive a signal [input] and map it to the LED fixtures [output]. But due to their construction, DVI controllers usually need to receive the input images in a linear way, in one whole block of information [often like a rectangle] — no matter how the actual LED installation looks like. You could also say that DVI controllers expect DVI fixtures to be installed in a predefined way. If you install the DVI fixtures differently, you need to change the input, too. This is no problem for MADRIX. It will transform the signal for your DVI controller according to your Patch configuration. While the DVI fixtures represent your LED installation in MADRIX and its Previews, you can customize their DVI Mapping settings for the controller that receives the signal. As shown above, DVI fixture settings and their DVI Mapping often are two different things if you add rotation, flipping, or spacing. That is why you will have to configure the normal DVI fixture settings and their DVI Mapping settings separately. 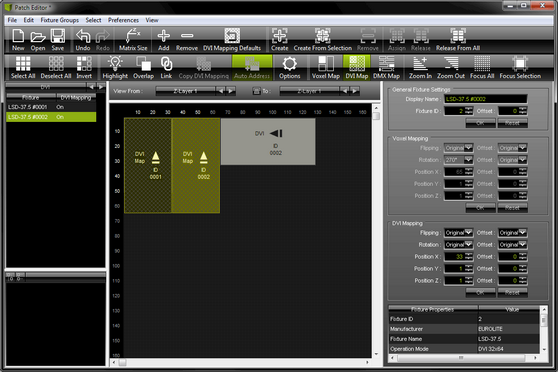 The Patch Editor provides three view modes. Regarding the DVI Patch the DVI Map is of special importance, since makes it possible to configure the required DVI Mapping of the DVI fixtures. 1] Position your DVI fixtures in the graphical workspace of the Patch Editor according to your LED installation [using the view mode Voxel Map]. 2] Set up the size of your virtual LED matrix [the Matrix Size]. Normally, the area it defines should include all of your DVI fixtures. 3] Activate the view mode DVI Map [Keyboard shortcut: F6] in the Patch Editor. 5] When using »DVI, activate the DVI Map Mode of the external DVI Outputs. When using »Proprietary DVI Devices [5A / A8 / T9], Step 5 is not required. Step 3, 4, and 5 will be explained below. Step 3, 4, and 5 are only necessary, if you wish to add spacing, rotation, or flipping to your Patch that includes DVI fixtures. The DVI Mapping of DVI fixtures represents the fixture configuration for the DVI hardware controller. 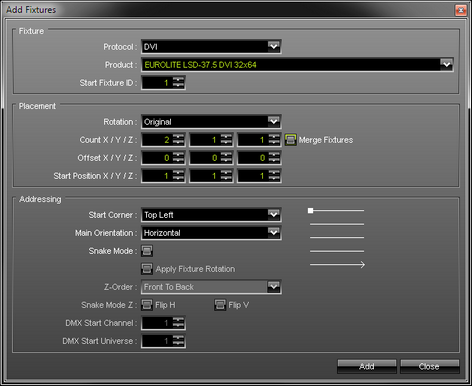 DVI Mapping settings can include their own position, rotation, and flipping settings. 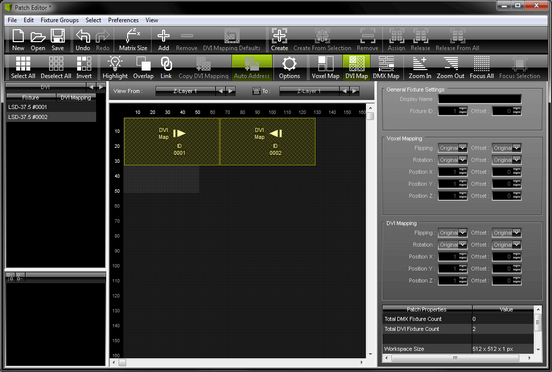 In order to work with DVI Mapping, you need to activate the DVI Map of the Patch Editor. You only need DVI Mapping if you are using DVI fixtures in a different way than what the DVI controller expects. DVI Mapping is inactive in the Voxel Map. It is shown in gray with a diagonal grid. DVI Mapping is active in the DVI Map. It is shown in yellow with a diagonal grid. When DVI fixture and its DVI Mapping have the same position, the DVI fixture is shown. 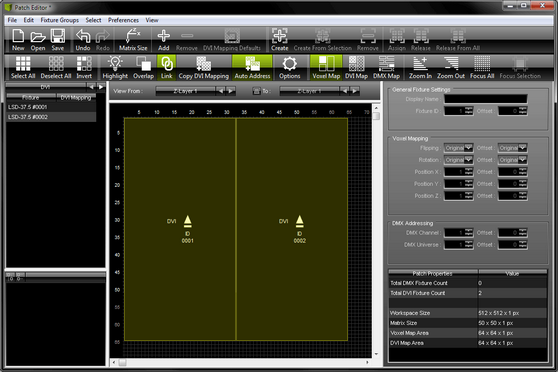 When DVI fixture its DVI Mapping have the same position, the DVI Mapping is shown. By default, DVI fixture and DVI Mapping settings are linked together. If a setting, such as rotation, is changed for the fixture or the DVI Mapping, the opposite setting [DVI Mapping or fixture, respectively] will receive the same change or a corresponding offset. Deactivate the feature in the menu Preferences > Link DVI Mapping And Voxel Mapping [Keyboard shortcut: Ctrl+L]. If activated, the icon glows green in the toolbar. By default, DVI fixture and DVI Mapping settings are not linked together. If a setting, such as rotation, is changed for the fixture or the DVI Mapping, the opposite setting [DVI Mapping or fixture, respectively] will not receive the same change or a corresponding offset. Deactivate the feature in the menu Preferences >Link DVI Mapping And Voxel Mapping [Keyboard shortcut: Ctrl+L]. If deactivated, the icon glows gray in the toolbar. Preferences > Allow Fixtures To Overlap. If activated, the icon glows green in the toolbar. DVI fixtures with adjusted DVI Mapping settings can overlap. That means that one Map can be positioned over another Map. You need to activate the feature in the menu Preferences > Allow Fixtures To Overlap. If activated, the icon glows green in the toolbar. A] Disabled: If a DVI fixture is copied, the DVI Mapping is reset to its default settings. That means it will have the settings of the newly copied DVI fixture. In fact, the copied DVI fixture has its own DVI Mapping. B] Enabled: If a DVI fixture is copied, the DVI Mapping includes the same settings as the DVI Mapping of the source or the settings plus a corresponding offset. If activated, the icon glows green in the toolbar. In the DVI Map, DVI Mapping settings cannot be copied like DVI fixtures. Please switch back to the Voxel Map. Edit > Restore DVI Mapping Defaults For Selection [Keyboard shortcut: Ctrl+R]. If clicked, the icon shortly flashes green in the toolbar. 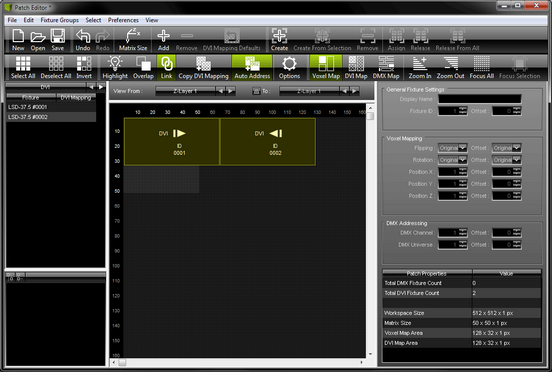 ▪ The DVI Mapping of DVI fixtures can be used and interacted with in the Patch Editor just as any other fixture. In other words, it can be positioned with the mouse or keyboard, for example. ▪ You may also edit the DVI Mapping settings directly. - Make sure view mode DVI Map is active. - Select the DVI Mapping of a DVI fixture and go to the section DVI Mapping to the right. - You may change the Flipping, Rotation, or Position X, Position Y, Position Z. - You can also add or substract an Offset for each of these items. ▪ At the same time, the section Fixture Properties / Value shows all necessary information for the DVI Mapping. ▪ When working in 2D, make sure to position your DVI fixtures and their DVI Mapping always on the first Z-level. That means Position Z must be 1! Please activate DVI Map Mode for your external DVI output. Activating DVI Map Mode for the external DVI output is only necessary for screen-capturing. ▪ The external DVI outputs offer a number of additional configuration settings. Make sure to configure everything as needed! 1] Create a new Patch. Select File > New Patch [Keyboard shortcut: Ctrl+N]. 4] We need to rotate both fixtures to match the LED installation. The left fixture is rotated by 90°. The right fixture is rotated by 270°. 9] Arrange both DVI fixtures with their DVI Mapping next to each other in the upper left corner. The DVI Mapping of DVI fixture 1 is positioned at Position X: 1, Position Y: 1, Position Z: 1. The DVI Mapping of DVI fixture 2 is located at Position X: 33, Position Y: 1, Position Z: 1. 10] Switch back to the Voxel Map. Select View > Voxel Map [Keyboard shortcut: F5]. 11] Select Edit > Matrix Size.... Enter Size X: 128, Size Y: 32, Size Z: 1, and Color Depth: 3. The virtual LED matrix now matches the size of both fixtures in total. ▪ It was necessary to configure the DVI Mapping of the fixtures separately because the DVI hardware controller expects to receive the input signal like this [also shown above in the Normal Setup]. ▪ The EUROLITE LSD 37.5 works with the EuroLite T9 protocol. No screen-capturing is needed and therefore DVI Map Mode does not need to be activated for the external DVI output window for this example. ▪ Make sure that DVI Mapping and DVI fixtures are not linked in the DVI Map [Disable Link mode]. ▪ If you receive an error message about the fixtures being out of range, then move your fixture towards a free location on your workspace. Please make sure to save your MADRIX Setup file after the configuration process. You may also save and/or export the Patch as a separate file [of the file type *.mpz or *.mpx].